Last month, visitors to Washington’s Olympic National Park were treated to a surreal sight. A helicopter crossed the sky dangling strands of drugged, blindfolded mountain goats—as many as five at a time—like a string of furry pearls. In the end, more than 100 goats were airlifted from the park and shipped to new homes across the state, all because they loved human pee too much. Lacking the dietary minerals they’d find in their natural range, park officials say some of the goats (which were introduced to the area in the 1920s) have become “quite aggressive” when seeking human sources of salt. Namely, urine. But mountain goats aren’t alone in their quest for liquid gold. A surprising number of creatures—from reindeer to locusts—have a known affinity for human urine. And for some species, this craving for our minerals has dramatically shaped their behavior. All animals need sodium and chlorine—the chemical components of table salt, which are essential elements that regulate fluids and enable the transfer of energy—to survive. Carnivores and omnivores like humans can often meet this need by eating other animals. And when we have too much, our bodies secrete these elements as waste products: That is, we pee them out. Plant-eating animals must turn to rougher fare. When the vegetation they live on doesn’t have the minerals they need, their only recourse is to eat dirt. Known as “geophagy,” this takes the familiar form of salt licking in large ungulates like cows and deer. Of course, not all soil is created equal. Wild ungulates are known to travel vast distances to reach naturally occurring mineral licks—and other animals will just as tenaciously seek out less geological sources of salt. When moths and butterflies gather to drink dirt through their straw-like proboscises, it’s known as mud-puddling. Some of the most attractive mud puddles are those created by animals seeking relief. This fact—that gentle butterflies are often gripped by an unquenchable thirst for our whiz—has been a boon to butterfly collectors. But animal attraction to human urine isn’t just a bit of hobbyist trivia. Sometimes, it’s a matter of life or death. According to Dr. Charles Stépanoff, an anthropologist at the École Pratique des Hautes Études in Paris, the Tozhu people of southern Siberia have long used urine to build relationships with the reindeer they rely on for survival. Apparently, by feeding Rudolph a kind of pee-pee popsicle. In other animals, however, the result of this urine-seeking behavior is conflict, not companionship. In Olympic National Park, the situation better resembles a movie made by Wes Craven than Disney. With stiletto-like horns and a decreased fear of humans, the park’s pee-crazy goats can even be deadly. In 2010, a 63-year-old hiker was fatally gored by a mountain goat in the park. For the goats, it’s more of a mixed bag. Last year, researchers published a paper studying how mountain goats attracted to human urine in Montana’s Glacier National Park responded to predators. Donning a grizzly bear costume “constructed from a Styrofoam head and a furred fabric cape,” lead author Wesley Sarmento found that pee-licking goats didn’t flee as far from the faux bear as non-pee-licking, backcountry goats—so long as tourists were around. The study’s results suggested that in addition to providing sweet, delicious urine, the park-goers acted something like a human shield against predators for the goats. For those seeking to maintain the historic distribution of mountain goats in the park, there are no easy solutions. In a world of almost 8 billion people, human urine is obviously abundant, but do nature’s pee junkies have any preference on how they get their fix? A 2008 study on yellow-spined bamboo locusts, a major pest (and known pee fan) in China, found the insects strongly preferred human urine that had been incubated for three to six days. Clearly, some animals have a nose for a good vintage. 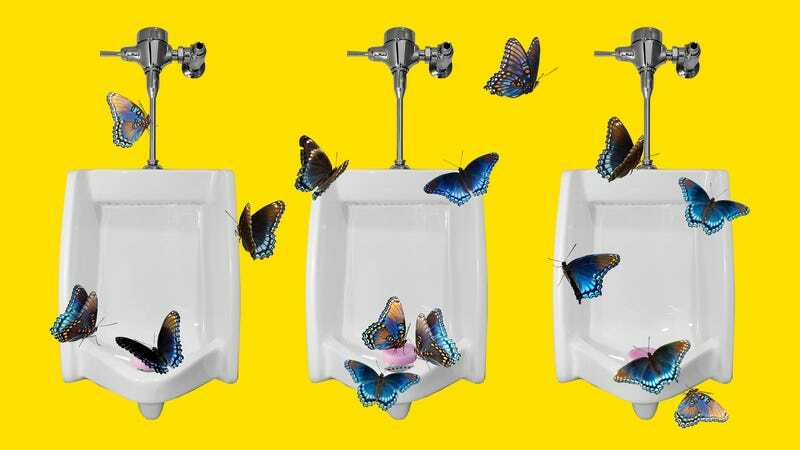 Dr. Bodri, who says he used to encourage students on study abroad trips to defecate in the forest so they could see how quickly feces were harvested for nutrients, had a different question: Do butterflies prefer the pee of some mammals over others? In a study published earlier this year, Dr. Bodri compared the appeal of carnivore, omnivore, and herbivore pee to butterflies in Georgia’s Piedmont region. For herbivores, he used cow urine from a nearby farm. For carnivores, he obtained cougar urine from The Pee Mart (which advertises itself online as “America’s First Discount Urine Store”). And the omnivore urine, well, was sourced locally. The results were stark: 97 out of 117 pee-sipping butterflies chose to quench their thirst with cougar urine. A stunning outcome, given that all samples were expected to have a similar sodium content. By feeding butterflies pee, Dr. Bodri may have only deepened the yellowy mystery. Other researchers have suggested butterflies use both visual and scent clues to locate mud puddles, possibly gaining protection from predators by visiting sites where other butterflies are already slurping. When stopping to drink urine, it seems, it’s safer to join a friend. Ultimately, however, the animals that drink the most human pee might be humans themselves. A cursory internet search will turn up countless examples of people consuming urine for, um, recreational purposes, and numerous historical sources describe instances of so-called urine therapy: the medicinal use of pee. On 10 December 1986, up to 55 [bumblebees] (queens and workers) congregated simultaneously to feed in a small ground area where human urine had been deposited a few hours before. To ascertain whether urine was actually the attractive agent, further urine was deposited on a second area 2 m away where no bumble bees were feeding at the time. On the next day, a similar concentration of bumble bees was observed feeding at this new spot. Viewed from afar, the transfer of sodium between animals via urine can look like a shining golden circle, where predators eat herbivores containing salt, and herbivores in turn lick up excess salt urinated by predators. But once humans enter the picture, this somewhat idiosyncratic behavior can become troublingly dominant. In urine as in everything else, we must conclude, there can be too much of a good thing.